i'll miss the match of @TeamQuetta today ???? Toss: Gladiators win the toss and elect to bowl first against Karachi Kings. 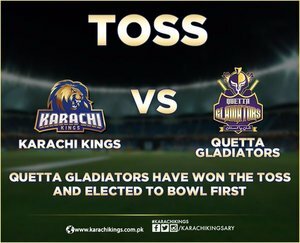 #HBLPSL #QuettaGladiatorsvKarachiKings #QuettaGladiators have won the toss and decided to field first. #PSLT20 #PSLrocksCricket "
Toss Alert: Quetta Gladiators Won The Toss And Elected to Bowl 1st. best of luck @TeamQuetta ???? Quetta have won the toss & invited Karachi Kings to bat First. Let's teach Karachi some cricket today. Go Quetta! Good luck to both @TeamQuetta & @KarachiKingsARY , looking forward to another exciting game ahead. #PSLT20 #HBLPSL #PSL ???????? Quetta Gladiators vs Karachi kings.